From left, Chris Aring, Olivia Jacobs, Samantha Hargy, Casey McAndrews, Lee Hayman and Kaela Vecchia-Zeitz. Not pictured is Marila Lemos. 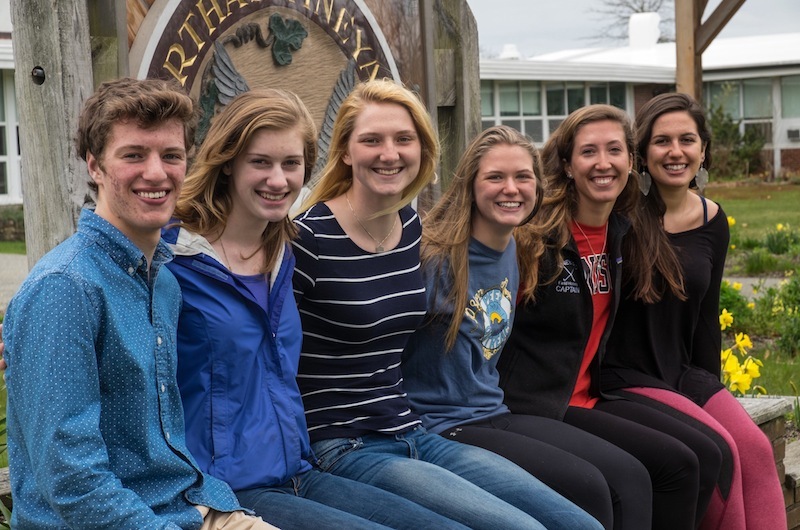 MVYouth has awarded $542,874 in college scholarships to seven Martha's Vineyard seniors to attend the college of their choice. The students are Chris Aring, Samantha Hargy, Lee Hayman, Olivia Jacobs, Marlla Lemos, Casey McAndrews and Kaela Vecchia-Zeitz. MVYouth was created in 2014 by Daniel Stanton and Jim Swartz, both seasonal residents of Martha’s Vineyard, to give back to Vineyard organizations and residents. The college scholarships are intended to serve as gap funding, after financial aid and family contributions are taken into account. The goal is for the students to attend college without having to graduate burdened with excessive student loans. Chris Aring will attend Olin College; Samantha Hargy, George Washington University; Lee Hayman, Denison University; Olivia Jacobs, Hamilton College; Marlla Lemos, UMass Boston; Casey McAndrews, Hamilton College; Kaela Vecchia-Zeitz, New York University. Thirty-eight students applied for the scholarships. With the support now of 55 founders who have each pledged $25,000 per year for four years, MVYouth will disburse in excess of $1.3 million per year for the next four years. MVYouth plans to continue giving at the same rate or greater in future years. Earlier this year, MVYouth awarded $511,000 in expansion grants to three Island nonprofits serving children and teens: the Boys & Girls Club of Martha’s Vineyard, the Martha’s Vineyard Skate Park Association and the Martha’s Vineyard Chamber Music Society. The next expansion grant deadline is in September 2016. The next college scholarship deadline is in February 2017. For more information, visit mvyouth.com. Congratulations to all these very deserving young people! And many thanks to the members of MVYouth.